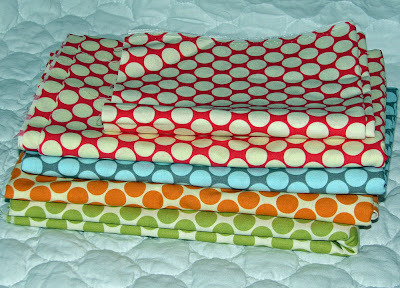 Sew Fantastic: Still looking for Full Moon Dots?? Still looking for Full Moon Dots?? Check out this site Quilthome.com. I just got an order from them in the mail today. I didn't want to share until I got my order being that last time I found a great opportunity, I was tricked into ordering some great stuff only to be sent a refund and a note in the mail saying no longer in stock over at (QuiltArts.com) now out of business. So I officially sharing the link for Amy Butler full moon dots. She has the whole collection of lotus and belle to, as well as Joel Dewberry's Aviary collection. Plus she has a promotion for all orders over 50.00 you get free priority shipping.. What a deal huh. You know I had to share this with all my lovelies so enjoy. Geez, I just ordered some from downshadowlane.etsy.com but she didn't have ALL the colors - good to know! I may have to purchase the missing colors from them - THANKS!